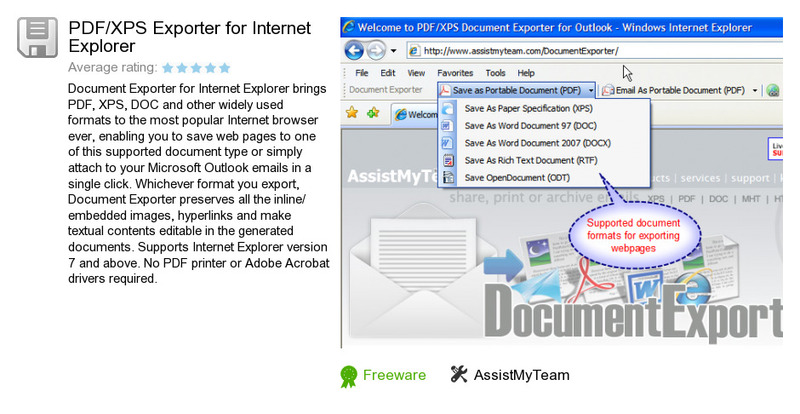 PDF/XPS Exporter for Internet Explorer is an application developed by AssistMyTeam. We know of version 1.0. Version 1.0 is downloadable at our site. PDF/XPS Exporter for Internet Explorer package has a size of 4,251,954 bytes. AssistMyTeam also publishes Team TimeSheet for Outlook & Database and Team TimeSheet Client.